Peripheral T-cell lymphoma (PTCL) is a complex group of entities with great heterogeneity in morphology, immunophenotype, and clinical features. The World Health Organization has recognized at least 29 PTCL entities, with few additional provisional entities. However, a large subset cannot be classified using current methodology and are designated as PTCL, not otherwise specified (PTCL-NOS). The molecular and genomic landscape of the major PTCL subtypes has been characterized recently, but largely unexplored for the rarer subtypes. In this chapter, the pathological features, concomitant with gene expression profiling (GEP) and acquired genetic lesion will be presented, highlighting molecular diagnosis and pathognomonic mechanisms. Recent genomic technologies have led to identification of recurrent mutation targeting epigenome (TET2, IDH2R172, and DNMTA), T-cell activation, and oncogenic pathways (STAT3, NF-κB) in multiple PTCL entities. 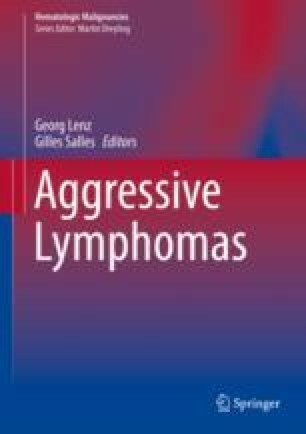 In general, cutaneous T-cell lymphomas sow distinct genetic and molecular landscape compared to the nodal diseases. However, there are marked differences in their frequency, with some quite distinct to specific entities (e.g., IDH2R172 mutation in angioimmunoblastic T-cell. We have briefly discussed some of the key findings from genetic studies and correlation with pathological observation where appropriate in this chapter correlating with GEP data and clinical features. The authors would like to acknowledge Tayla Heavican in preparation of this manuscript. We would also like to thank many esteemed investigators in T-cell lymphoma biology, whose work was cited in this paper.